When I hear the words, we want a younger dog or this dog will die too soon, I want to take the person who uttered them and show them how foolish their statements are. In this age of economic hardships, disposable products, relationships and pets, we in rescue see the best and the worst of people. While we’ve not known the people to see their best and their worst, it quickly becomes self-evident in the Goldens we welcome into our fold. Raising a Golden Retriever is quite similar to raising a child properly. They need constant and proper care, rules, discipline, consistency and love. While our children mature beyond the mental age of three and develop their abilities and thought processes accordingly, our Goldens never do. They continue to need many of the same things they needed as puppies: exercise, discipline and affection. This breed is extremely people oriented, needy and dependent. They need to be around their family, just to be close. As M. Facklam said, ‘We give dogs time we can spare, space we can spare and love we can spare, in turn they give us their all. It is the best deal man ever made’ A Golden can be a great friend and companion to adults and children. The Goldens we rescue are given up by the best of us, and by the worst of us. They are given up by people who meant well and had the best of intentions, and they are given up by people who didn’t care about them — ever. They just wanted the cute cuddly puppy they’ve seen in commercials, a built-in babysitter or child’s toy. In rescue, we see a lot sometimes maybe too much. As you can imagine, most of the rescued Goldens have baggage they bring with them into a new home. It takes a great investment of patience, training and caring to repair and retrain the Golden created by an uncaring or unknowing owner. It is always worth the necessary diligence, effort and commitment. And then we have the older Goldens, those dogs who are confused for a while when they have to leave the homes they have known most of their lives. If they have been in a family with children, most of them love kids. You can see it in their eyes. You can see it in their demeanor – they just light up from the inside out. As a rescue volunteer, I have been privy to this experience repeatedly over the years. It will bring tears to your eyes and joy to your heart. Even if they have been in a home without children, they have definite value in this world of disposable pets. They are what they are; they have house manners and people manners. They have already learned not to chew on furniture or go chasing through the house. They will survey their new domain; they will give their broken heart to their new family not knowing if they will lose this family as they did the first. They again count on their people to be there for them to take them for a walk, to give them a cookie, to provide them with a hug and a kind word. They again count on their new family to be there with them forever – a longer forever family than the previous forever home. Should they hope for less? Can you offer them no less? They may die soon, you say. So they may. But their life, as with ours, comes with no guarantees. 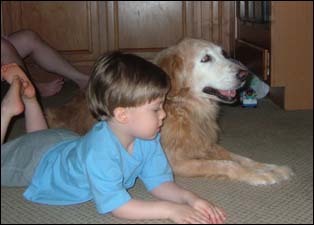 The two year old Golden may die at three from renal failure; the three year old may die at four from cancer. I may die tomorrow. But, knowing that life has no guarantees to offer us or them, makes it, ultimately, that much more precious to us. Being older does not make a Golden less joyful, less loving, less well behaved. Being older does not mean a Golden cannot live three, or four, or five more years, maybe longer. It does make it likely that they will live for only a few more years but again, no guarantees. So if we each have an opportunity to add that special Golden that seems perfect for us to our family we should not think about how little time we may have together; we should think about what we would be missing if we did not grab that time together. I have not met very many senior Goldens I did not like; unfortunately, I have met several young Goldens I would not want in my family. Nearly every Foster Family has placed an older Golden with a family and each of those families feels that it was a privilege and a joy to open their home to these special Goldens. So when you are checking on Goldens you may want to add to your family, do not discount the older Goldens without further thought. When we look at the years we will have with our Goldens, dont think of the quantity of years – remember it is really the quality of whatever time you have together that truly counts. Consider the older Goldens with an open mind and heart – give them a look, ask about them, many of them are truly the gentle souls with grandeur and good nature second to none. He too can go for a walk, can play, can be silly, have personality, and have dignity. He may be the Golden your children will remember their whole life. Like people, all Goldens are not created equal and like people, the older Golden may just be the best of all Goldens.